Since its inception in 1959, the foremost goal of the Gettysburg Battlefield Preservation Association is to ensure the preservation of hallowed ground – land and features involved in the battle and its aftermath. The original Gettysburg National Military Park has been greatly enlarged due to property obtained by the GBPA and turned over to the park and acquisitions in which GBPA played an important role. The Pennsylvania Gettysburg Monuments Project was founded in 1997 by state Rep. Harry Readshaw (D-Allegheny) with the assistance of Legislative Assistant Kathi Schue and Information Specialist Jay Purdy. Within weeks of its formation, the GBPA became a partner in the campaign. 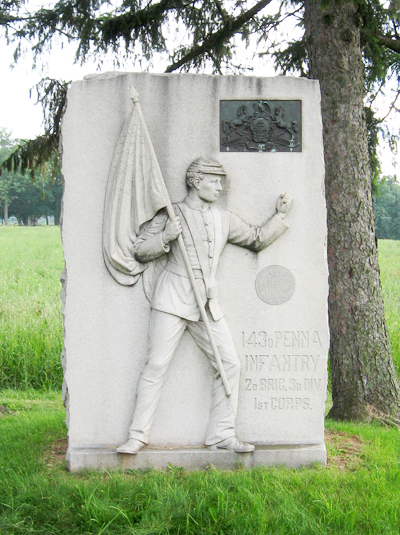 After a careful search, 146 monuments and markers were identified representing Pennsylvania regiments and soldiers on the grounds of the Gettysburg National Military Park in need of repair and routine cleaning and maintenance—not including the large Pennsylvania Monument, which is maintained by the Commonwealth. In 2003, the GBPA set up the Gettysburg Battlefield Monument Trust at the Adams County National Bank (ACNB) to provide an endowment for future maintenance. To date, the project and its preservation partners have raised over $400,000 including grants and Trust income to cover all the non-equestrian Pennsylvania monuments on the battlefield in perpetuity (excepting a limited number of PA monuments that are individually endowed by other organizations). Funds are distributed by the Trust to the Gettysburg National Military Park for scheduled monument maintenance. GBPA is now committed to raising additional funds to provide for the remaining equestrian monuments. Unfortunately, funds raised must sometimes be used to make emergency repairs to monuments necessitated by vandalism and storm damage—a task well within the mission of the GBPA’s Pennsylvania Gettysburg Monuments Project. These events are sponsored by the GBPA and their preservation partners, Rep. Harry Readshaw, Victorian Dance Ensemble and A.B.A.T.E. of PA. Direct donations are accepted to GBPA Pennsylvania Gettysburg Monuments Project or show your support by purchasing “PA Monuments” License plates. Blue & Gold, “GB 1863: PA Monuments” unofficial license plate. The GBPA Gettysburg Pennsylvania Monuments Project created this plate that graces the fronts of many cars and trucks in Pennsylvania and elsewhere. These plates are available at $20 each at the Historic Daniel Lady Farm and at GBPA events. All proceeds benefit the Monument Project. 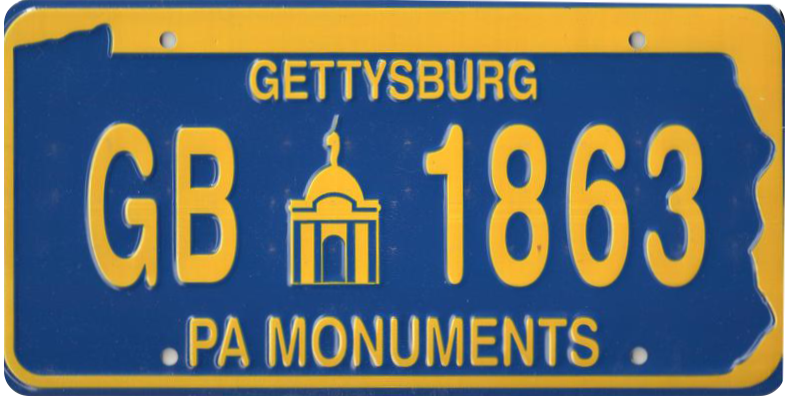 The Pennsylvania Monuments registration plate, “Gettysburg 1863”, was proposed by Rep. Harry Readshaw, enacted by the Legislature, and approved by the Governor in 2014. The cost of the special license plate is $54, not including the annual registration fee. From each special plate, $23 goes to the Veteran Trust Fund and will provide grants for the cleaning, repair and restoration of the Pennsylvania monuments by the Gettysburg National Military Park. Nonprofit organizations may apply for these grants to restore specific monuments proposed by the organization. While the official PA License Plate program is not affiliated with the GBPA, the state grants supplement the funds raised by the GBPA to preserve monuments. To apply for this registration plate, please complete PennDOT Form MV-911 (PDF), "Application for Special Fund Registration Plate."